Over coffee one surprisingly sunny January morning, Yaser was updating me on all the developments at the Team Margot Foundation. As you’ll know, there’s always rather a lot going on, and I get the impression that sitting down for half an hour for a coffee and a chat isn’t typically in Yaser’s repertoire. We got around to discussing the foundation’s primary mission – that everyone should join the stem cell register, but particularly those from a BAME or mixed heritage background, as these groups are seriously underrepresented. Of the already shockingly-low 2% of the population who has joined a UK stem cell register, just 3% of that number are from a BAME or mixed heritage background, making it statistically very difficult, if not impossible, for some to find a bone marrow match when they most need it. Yaser was telling me about his and Vicki’s rather exotic backgrounds – Thai, Syrian, New Zealander, Irish – and making me rather envious. As a pale, occasionally ruddy-looking, thorough-bred English girl, the only way I felt I could fully join in with the conversation was to live vicariously through my husband, who is half-Japanese, half-English. We have both joined the DKMS register, but I glibly quipped that the register doesn’t need more people like me – solidly British, in fact, pretty solidly Mancunian. Yaser made a bet with me that if I were to do an ancestry test, I might be surprised – we’re all individuals and it’s taken us thousands of generations to get to the person we are today. I had been toying with doing one of these tests for a while and so gamely agreed. The test kit was ordered and a week later I found myself valiantly spitting into a test tube (it takes quite a lot of effort to reach the required amount…) and I returned the pack for sampling right away. The results do take a little while to come back to you but, depending on the company you use, the sample has a long way to travel. It was about six weeks in total until the results came back, which is rather a long time when you’re eagerly awaiting something. I talked at length about it with my family, which brought up stories of Irish, Welsh and Scottish family members, but that was about as far-reaching as we seemed to go. One afternoon, I received an email saying that my results were in. I opened the email with anticipation, and the webpage seemed to take an age to load. There it was – 79% British/Irish, not at all a surprise, but then the biggest shock – 10% Franco-Germanic! Which, in the grand scheme of DNA, and for someone whose family is not at all exotic, is not insignificant. What’s more, this relative, likely a great-great grandparent, was only born between 1780 and 1830, so we’re talking fairly recent history, too. The remaining 10% is a little more difficult to pinpoint… a little Scandinavian (which explains my love of ABBA) and Eastern European but, sadly, yet tantalisingly, the rest was ‘unknown’. It was a pleasant shock and surprise to find out that I am more mixed than I thought – granted, 20% isn’t much, but it just goes to show that we will all be more mixed than we might think! Yaser was right; we are all individual, just like our parents, our grandparents and our great-grandparents before us, who have all contributed to make us who we are. Even if you’ve always lived in the same street, in the same town, who’s to know what your genes might reveal? 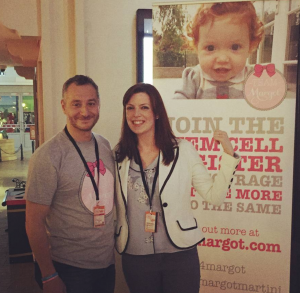 I’m now even more determined to get “just one more” signed up to the stem cell register – the more of us that are on there, with all our mixed heritages, the more chance we have of being the perfect match for someone when they need it most. Hayley is currently completing her MA in French-English Translation. Previously she worked at Great Ormond Street Hospital Children’s Charity in the Philanthropy team. Hayley is a blood donor and registered organ donor. 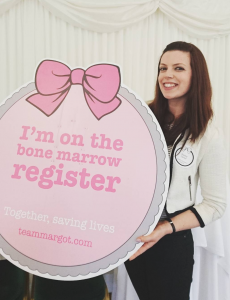 She has been on the bone marrow register since 2015.